The ERP Training Schedule with Mock Live Excel Template is an excellent tool to use for your business. If you need to keep track of employee training in your company, the ERP Training Schedule with Mock Live Excel Template is an excellent choice. 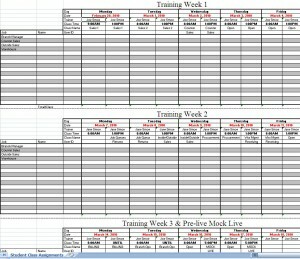 The ERP Training Schedule with Mock Live Excel Template is completely free and easy to download. You can download the template into excel and save on your desktop. The beauty of using this program in excel is that it is fully customizable to your unique needs and preferences. 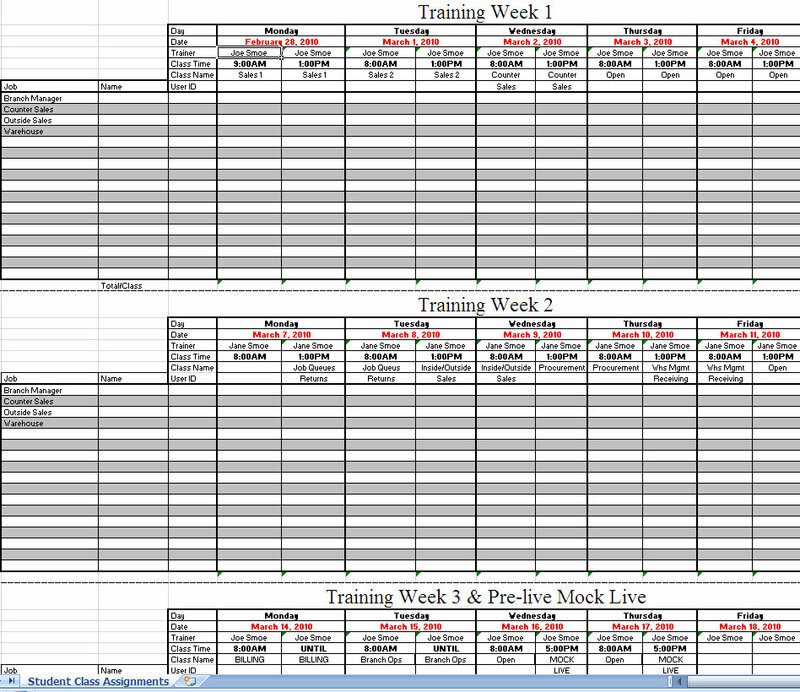 For each ERP Training Schedule with Mock Live Excel Template training sheet, you can create a new page. Each page will have the same headers going across the sheet with the days of the week. Sub headings can include, date, trainer, class time and class name. In the left hand column, information about the attendees to the class can be added with names. The company will have a comprehensive record of what trainings each employee has attended. If the employee has a unique company ID, this also can be added to the sheet for verification of attendance. These training schedule management templates can be used throughout the company. Human Resources will be able to use these records of training when evaluating employees. These training records will be useful for promoting employees or counseling employees for time and attendance infractions. Management will be able to manage and track trainings for new employees, current employees and annual training requirements. For example, the OSHA training is required in many workplaces such as the healthcare field where training is mandated annually. For many employers who manage employees on different shifts, making sure that all employees have had updated trainings is essential to running the company efficiently. The ERP Training Schedule will keep all aspects of your business on track, from human resources to accounting and marketing. The ERP Training Schedule with Mock Live Excel Template will be an invaluable tool for the successful day to day management of your company and employees. You can download the free, customizable template in a few seconds and save it to your desktop in Excel, ready to use.